By Sharon Adams with illustrations by Robert Carter. Originally published in Legion Magazine September/October 2017. Reproduced with permission of Legion Magazine. He joined the Canadian Armed Forces (CAF) in 1984, served in Cyprus in 1988-89 and the First Gulf War in 1990-91. But he was never the same after missions to Somalia in 1992 and Rwanda in 1993-94. He had vivid nightmares, flashbacks of horrible deaths of children, hair-trigger rage, vertigo and nausea, seizures, diarrhea, insomnia so bad he could only get to sleep after staying up for days and drinking himself insensible. Symptoms—and the drinking—persisted after he returned to Canada, resulting in a court martial in 2000 and discharge from the service and loss of his marriage. He was eventually diagnosed with post-traumatic stress disorder (PTSD). But time and effort did nothing to quell the symptoms. Treatment followed treatment. Prescription followed prescription. “The meds didn’t work the way they were supposed to,” amplifying problems instead, he said. Then, several years ago, his psychologist asked if he had ever taken mefloquine. The penny dropped. Treatment for PTSD didn’t work on some of his symptoms because they were not caused by PTSD. His persistent non-PTSD symptoms are all listed by some researchers—including retired military physicians and neurologists in several countries—as symptoms of mefloquine toxicity. That list also includes anxiety, depression, suicidal and homicidal thoughts, paranoia, delusions and hallucinations. He was recently diagnosed with mefloquine-induced acquired brain injury. Bona was among 900 troops deployed to Somalia in 1992 on the mission during which 16-year-old Shidane Arone was beaten to death, an action that ultimately resulted in the disbanding of the Canadian Airborne Regiment. The troops were required to take mefloquine before it was approved for sale by Health Canada. It has been widely reported that the troops had been given the drug as part of a safety study, and that monitoring requirements were not met. The auditor general found in 1999 that the soldiers were not asked for informed consent, and the CAF and the Department of National Defence (DND) did not monitor, record and report adverse reactions as required for clinical trials. chief from 1987-1992, told the Edmonton Journal in 2016 that DND pushed to get access to mefloquine and received approval to use it under clinical trial rules, but failed to monitor and record adverse effects. As well, she said, Health Canada failed to ensure that DND followed the clinical trial protocol. “Valuable information about the safety or effectiveness of the drug under ‘field’ conditions was not collected,” then Assistant Auditor General Maria Barrados testified before the Commons Standing Committee on Public Accounts in 1999. Somalia veterans say they were given an oral briefing on malaria and mefloquine and its side-effects, but were not told to stop taking it if they had bad nightmares or other psychological effects, and were not screened for contraindication. 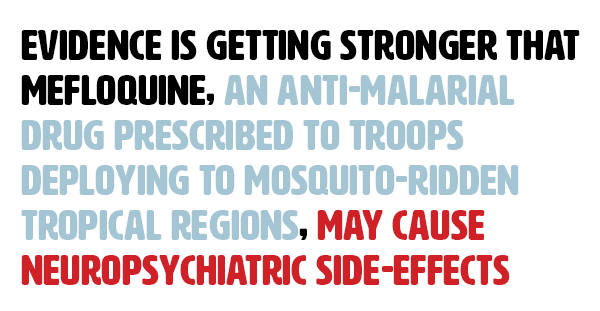 Mefloquine is one of the few effective anti-malarial drugs available. Without protection, the CAF projected up to 27 malaria cases a month, and several deaths during the deployment. At the time, it was believed mefloquine had no long-term mental health effects and adverse reactions were rare and would cease when the medication was stopped. And it could be taken weekly, rather than daily, offering better protection. The benefits were believed to be worth the risk. But right from the first dose, some soldiers, including Bona, experienced problems. “The first day I took mefloquine…I immediately felt sick,” he said. Initially he would have symptoms only on dose days, but eventually some became constant, and other symptoms return randomly even to this day. Vivid dreams and dizziness are common side-effects. But some soldiers experienced more serious adverse effects including nightmares, insomnia, depression, anxiety and paranoia. A few had hallucinations. 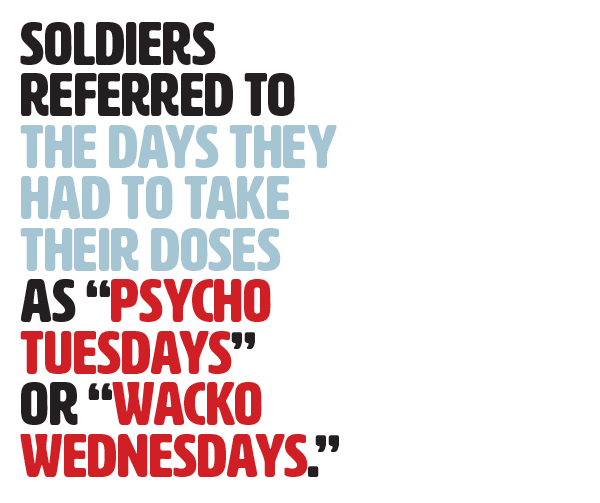 Soldiers referred to the days they took their doses as “psycho Tuesdays” or “wacko Wednesdays,” marked by “meflomares”—vivid and horrific nightmares. But Health Canada did not hear of these soldiers’ adverse reactions. The drug was licensed in Canada in 1993, and the CAF eventually gave it to 18,000 troops. Retired Lieutenant-General Romeo Dallaire told the Commons Standing Committee on Veterans Affairs this year that he asked to stop taking the drug during the 1993-94 Rwanda mission because it affected his memory and ability to think. He was ordered to continue, under threat of court martial. Chief on his mind at the time were preventing the genocide of civilians and the massacre of peacekeepers, as well as how to deal with child soldiers. Malaria is caused by a parasite passed along in the bites of certain mosquito species. They infest the liver and invade red blood cells, which carry oxygen and nutrients. The cells turn stiff and viscous, impeding blood flow to organs, especially the brain, and causing the heart to pump harder. Parasites can lie dormant in the liver for years, then spring back into action, sickening untreated victims sporadically throughout their lifetimes. The disease can cause uncontrollable shivering, high fever, deep fatigue, headache and low blood sugar. Untreated, it can lead to trouble breathing, convulsions, coma, kidney and liver failure and death. Malaria is a particular bane to the military, turning battle-ready soldiers bedridden very quickly. It can kill quickly, too. 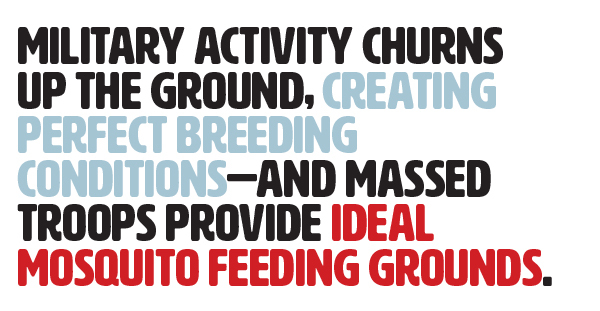 Military activity churns up the ground, creating perfect breeding conditions—and massed troops provide ideal mosquito feeding grounds. The disease spreads easily because everyone infected becomes a carrier, passing the parasites along to disease-free mosquitos. Hundreds of millions of people contract malaria each year, and about half a million die. Malaria has altered the course of history, claiming emperors, kings and generals, robbing conquering armies of strength to invade. Napoleon flooded the Dutch countryside in 1809, declaring, “We must oppose the English with nothing but fever, which will soon devour them all.” About 40 per cent of Britain’s 39,000 troops were stricken. During the First World War, malaria immobilized armies in Macedonia. “Regret that my army is in hospital with malaria,” a French general replied to a British request to attack; just under 80 per cent of his 120,000 troops were hospitalized. Malaria infected more than 40,000 U.S. troops in Vietnam, prompting military research between 1963 and 1976 into a quarter million substances with promise for prevention and treatment. Mefloquine was number 142,490. It remains one of the few effective anti-malaria drugs. Despite the absence of phase III clinical safety and tolerability trials, mefloquine was subsequently licensed—and used by the military—in many countries, including the U.S., Britain, Ireland, the Netherlands and Australia. Anti-malarial drugs were authorized “on the basis of an incomplete knowledge base, and at too early a stage in the normal cycle of drug development” and the licensing bodies were influenced “perhaps subliminally” by the military-industrial-governmental lobby, wrote Royal Army Medical Corps Lieutenant-Colonel Ashley M. Croft in the Journal of the Royal Society of Medicine in 2007. For years, he said, reports of adverse reactions were dismissed first as rare occurrences, then as due to other factors, then as media hype. From the beginning, the manufacturer warned that mefloquine could cause adverse effects. Warnings got sterner over the years, and now include psychiatric symptoms that may become permanent. A U.S. “black box” warning in 2013 said neurological side-effects could become permanent. Britain’s Medicines and Healthcare Regulatory Authority warned that nightmares, anxiety and depression could warn of more serious events, and that cases of suicide had been reported. European regulators also warned of the risk of irreversible neurological damage. Health Canada added mental health risks—anxiety, paranoia, depression, hallucinations and psychotic behaviour—to the mefloquine warning label in 2016. Mefloquine has been linked to murders and suicides in nearly every country where it was issued to troops: to murder-suicides at a U.S. army base in 2003, to a 2012 massacre of 16 Afghan villagers, including children, by a U.S. soldier, and to suicides among Irish and Australian troops. Veterans in several countries began describing it as “the suicide pill.” The U.S. declared it a drug of last resort in 2013. Military special forces in many countries, including U.S. Navy SEALs and the army’s Green Berets, have banned its use. 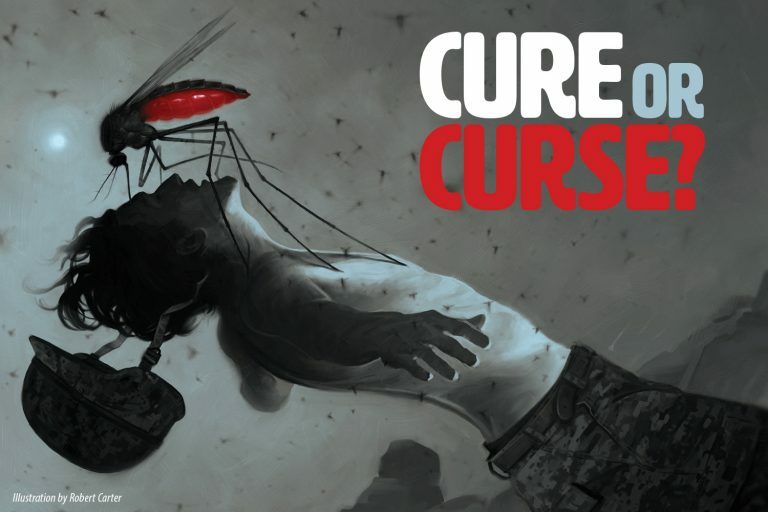 A 2017 CAF Surgeon General’s report recommends that mefloquine not be used as a first option for malaria prevention, but that it may be prescribed to those who have previously tolerated it and prefer it and when there are no suitable alternatives. It noted a gradual decline in its use since 2004; in 2016, only 20 prescriptions were written. In 2006, mefloquine was found to be neurotoxic in animals in doses equivalent to that used in humans. Researchers in several countries soon were convinced human symptoms were caused by damage to the brain. They called it acquired brain injury from mefloquine toxicity, a designation disputed in some military circles. A 2017 Health Canada safety review found limited evidence to support the conclusion mefloquine causes long-lasting and permanent neurological and psychiatric adverse effects. Ironically, the CAF contributed to that lack of evidence by not doing a safety study of the 900 troops sent to Somalia in 1992. “Had they done…we could have spared a future generation any problems,” said retired major Remington Nevin, a former army and preventive medicine officer now a post-doctoral fellow with the Johns Hopkins Bloomberg School of Public Health. Although mefloquine has been used by millions of people over the past 30 years, relatively little is known about how it kills parasites or what it does inside the human body. Researchers in England and Australia recently found it binds (imperfectly) to ribosome inside the parasite’s cells, disrupting production of proteins, which are vital to building cells, digesting food and moving muscles. Other research is focused on improving that bond to make the drug more effective, and hopefully less toxic to humans. Adverse effects are not experienced by everyone, and are mostly short-lived. But it’s just not possible to predict who will be severely affected. Some early researchers suggested genetic variations are the cause. Recent research suggests it’s a variation in enzymes from person to person. Enzymes activate the drug, then eliminate it before toxic byproducts build up. But it is thought that some humans lack the enzymes needed for elimination, so toxins build up, damaging neurons and accumulating in the brain stem and structures regulating emotions. The result is neurological and psychiatric symptoms—but the damage is physical. In 2002, British researchers found mefloquine caused liver and thyroid damage in some people. The effect is worsened by dehydration, which happens in the hot countries where troops often deploy, and by alcohol use. The World Health Organization still recommends mefloquine, as benefits outweigh risks when taken as prescribed. But it warned in the early 1990s that neurological or psychiatric symptoms could result. It recommended the drug not be used by anyone whose job requires fine co-ordination, such as pilots. At the first signs of adverse reactions, the drug should be discontinued. “And—most of the time—that is simply impossible when a sudden, mass deployment of hundreds of troops is necessary,” said Julian Lewis, head of Britain’s Commons Defence Committee, which investigated military use of mefloquine. “Mefloquine cannot be used as directed in military settings,” said Nevin. The troops themselves may dismiss symptoms as a reaction to the stresses of deployment: heat, trauma, long hours on duty, dehydration. Stigma prevents some from reporting psychological symptoms. After deployment, continuing symptoms can be misattributed to PTSD or traumatic brain injury, which share many of the same symptoms as mefloquine toxicity. The military could also improve its screening of troops to eliminate those with pre-existing conditions and its monitoring of adverse effects. Record keeping on deployment may be inconsistent and records can get lost. Post-deployment reporting can also be spotty, inconsistent or not designed to capture information necessary to identify mefloquine problems. Many British veterans have reported that they were not screened for pre-existing conditions nor told about the potentially permanent adverse effects. As well, “a number of troops discard [their mefloquine] rather than risk its potentially dangerous side-effects,” said Lewis. Veterans, their families and advocates in several countries have fought for decades for their militaries to acknowledge the damage caused by mefloquine and do something to help those afflicted. The Royal Canadian Legion sent letters to the ministers of defence and veterans affairs in November 2016, urging them to undertake research into mefloquine and stop its use while this investigation continues. “Our sailors, soldiers and airmen and women deserve to know the side-effects and to receive the proper diagnosis so they can receive the proper care,” as well as help linking their condition to service for disability benefits entitlements, wrote Dominion President Dave Flannigan. Individual and class-action lawsuits have been launched by mefloquine veterans in several countries. In 2013, the Journal of the American Academy of Psychiatry and the Law ran an article outlining issues that may be raised in such suits. The International Mefloquine Veterans’ Alliance has raised awareness and advocated for government inquiries. Canadian members of the alliance want the military to admit mefloquine causes harm, identify those who suffered adverse effects and see they get help, and support research into diagnosis and treatment. They also want the military to establish a single point of contact for those with mefloquine symptoms, as did Britain in 2016. Only one of their wishes was addressed in the 2017 CAF report, which recommends mefloquine “be viewed as a less preferred agent.” Three of its four recommendations addressed better CAF screening, education and auditing of anti-malarials. Nine studies, involving some 400,000 military personnel, met the inclusion criteria—comparing adverse effects of other anti-malarials to mefloquine. The report also reviewed records of Canadian military members prescribed the drug between 2013 and 2016 and found documentation of screening for contraindications in 38 per cent of 111 cases. As well, 12 per cent were prescribed the drug despite having health conditions that should have disqualified them from using it. Case reports, studies on mefloquine alone, and studies of civilian populations were excluded. Australia, for example, has found the drug to be a plausible cause of chronic central nervous system toxicity syndrome, and a British report said the drug carries an unacceptable risk of severe side-effects for its deploying troops, he said. The Commons report also recommended Veterans Affairs Canada (VAC) reach out to Somalia and Rwanda veterans to ensure they receive health services and support and VAC benefits and programs to which they are entitled. And it recommends VAC co-operate in mefloquine research programs. Meanwhile, VAC says veterans may make a claim for benefits for a condition related to the use of mefloquine during service, if there is a link between their medical condition and mefloquine and there is supporting medical information from the physician treating them. But Veterans Ombudsman Guy Parent is concerned that some veterans may not be able to link symptoms and diagnoses to their service. “This is an issue that requires a whole-of-government approach,” he said, pointing out that other governments, including the U.S., U.K., Australia and Germany, have provided services, including support in applying for benefits for mefloquine toxicity, educating veterans and healthcare providers, funding research and adding mefloquine to the list of other toxic agents, such as Agent Orange and asbestos. Investing in research is particularly important, said Bona, because there are few treatments available for mefloquine toxicity and acquired brain injury. It’s obvious he’s thinking of other mefloquine-addled veterans who do still wake up thinking about suicide. Liver and thyroid damage is also a side effect. There is a potential like between antimalarial drugs and diabetes. Although anecdotal, upon return from East Timor, a number of sailors were diagnosed with diabetes although when they deployed they were normal. Recent studies indicate there may be a link.